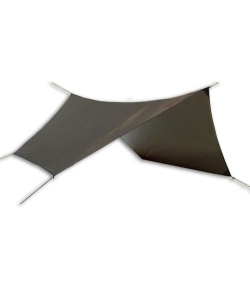 This PU-coated polyester ripstop rainfly works with all Hennessy Hammock models providing generous protection from wind and rain. Can be angled out to provide a large covered area for cooking or relaxing or can be staked down near the ground on both sides of the hammock. The "Hex" Fly can also be used on its own. Packed Size: 3.5" x 11"